The garden is definitely in an end-of-summer state. Yesterday I picked almost all the tomatoes and “decomissioned” all but two of the ten plants. 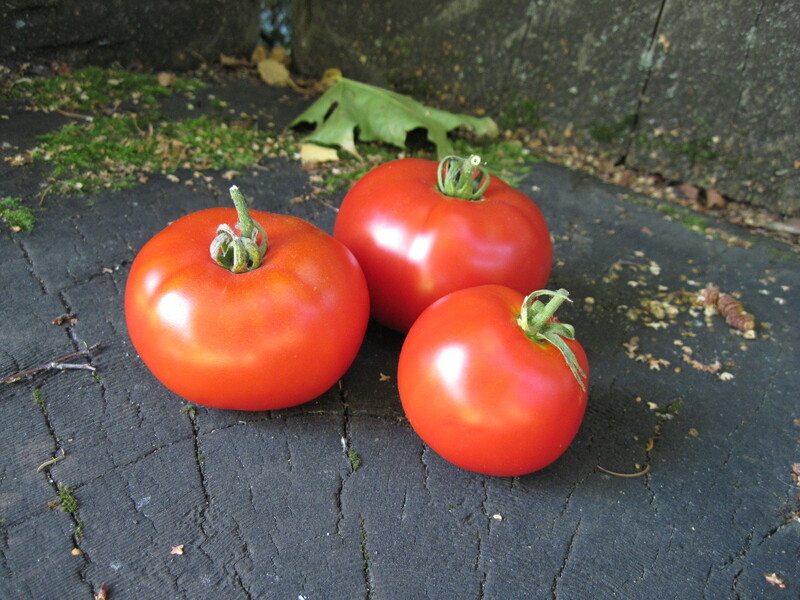 This was a stellar summer for tomatoes — nice and warm — and I somehow got the soil mix for their pots just right. I used mushroom manure instead of steer manure. I seem to recall that mushroom manure (“I didn’t know mushrooms did that”) has a higher pH. Maybe that was it, or maybe mixing in the stuff quite generously did the trick. Despite 22 mm. (nearly an inch) of rain a couple of weeks ago, the soil is really dry. The wretched Norway maples are dropping leaves by the bushel — ugly, khaki-coloured leaves that give the garden a slovenly air. Raking them up perked things up instantly. 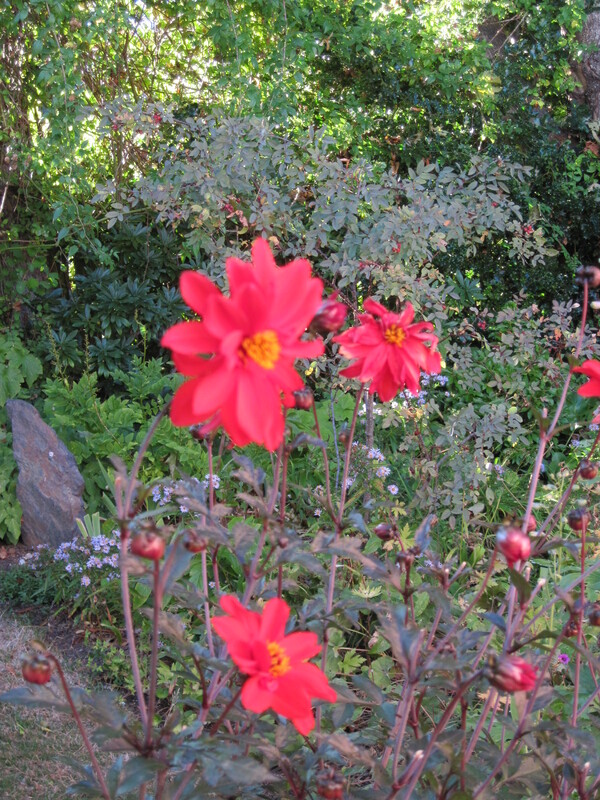 The dahlia ‘Bishop of Llandaff’ continues to put forth blooms and buds. I top-dressed it with the mushroom manure soil mix and slow-release fertilizer back in June. 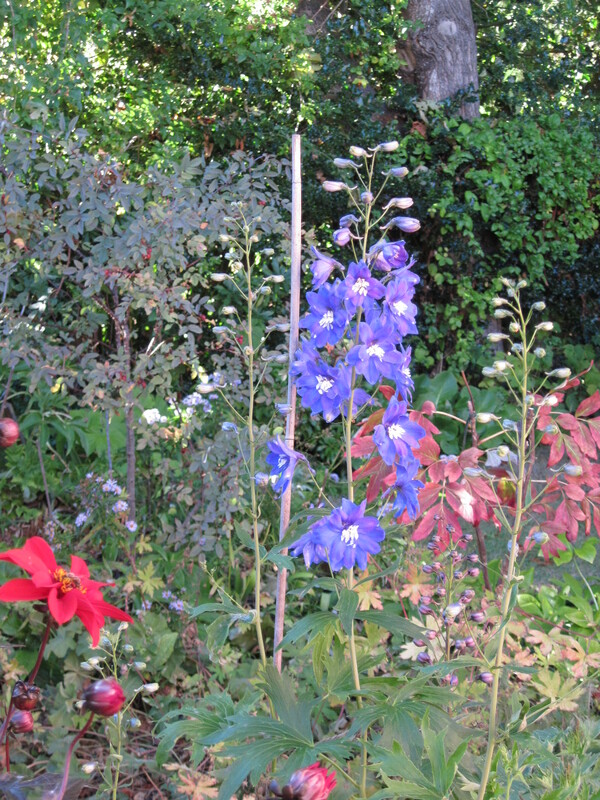 And the potted delphiniums are starting their second flush of bloom — much better than the first one. Together they add some freshness to the tired scene. Gardening is never done. I always have a list of Things to Do and little projects to work on. This fall I’ll be starting on something I think of as the Boulevard Project. There is a 12-foot wide stretch of scruffy lawn between the front part of my place and the sidewalk. Technically, this belongs to the municipality, and nothing must be planted on it except grass and municipal trees (flowering cherries on our street). But of course weeds creep in. A stretch of boulevard next to mine boasts a huge crop of what I think of as “leathery dandelions” although they are really something called hairy cat’s-ear (Hypochaeris radicata). “Weed” is definitely the word for them. They send puffballs of seeds all over the place, and it’s becoming a struggle to hoick out plants that have come up in my scruffy grass. I’ve decided there is nothing particularly attractive about stretch of scruffy grass and ugly weeds, so I’m going to introduce some tough (and yes, weedy) plants to provide something besides yellow and puffballs to the scene. I have grown from seed a couple of plants of chicory (Cichorium intybus), which has gorgeous sky-blue dandelion-shaped flowers. Once established, the plants can be cut short to encourage them to bloom close to the ground. Blue dandelions! I’ll pair them up with beach peas (Lathyrus japonicus), which look like sweet peas in shades of pink (and some whites), but are a lot tougher. Sadly, they are scentless, but look good with the blue chicory flowers. All of this may come to naught, like many garden plans. Weeds, when grown on purpose, sometimes become temperamental and die, as if to prove that they will not be manipulated.